An icon of the environmental movement outlines a provocative approach for reclaiming our planet. According to Stewart Brand, a lifelong environmentalist who sees everything in terms of solvable design problems, three profound transformations are under way on Earth right now. Climate change is real and is pushing us toward managing the planet as a whole. Urbanization - half the world's population now lives in cities, and 80 percent will by midcentury - is altering humanity's land impact and wealth. And biotechnology is becoming the world's dominant engineering tool. In light of these changes, Brand suggests that environmentalists are going to have to reverse some longheld opinions and embrace tools that they have traditionally distrusted. Only a radical rethinking of traditional green pieties will allow us to forestall the cataclysmic deterioration of the earth's resources. Whole Earth Discipline shatters a number of myths and presents counterintuitive observations on why cities are actually greener than countryside, how nuclear power is the future of energy, and why genetic engineering is the key to crop and land management. With a combination of scientific rigor and passionate advocacy, Brand shows us exactly where the sources of our dilemmas lie and offers a bold and inventive set of policies and solutions for creating a more sustainable society.In the end, says Brand, the environmental movement must become newly responsive to fast-moving science and take up the tools and discipline of engineering. We have to learn how to manage the planet's global-scale natural infrastructure with as light a touch as possible and as much intervention as necessary. BONUS AUDIO: Includes an exclusive afterword written and read by author Stewart Brand. 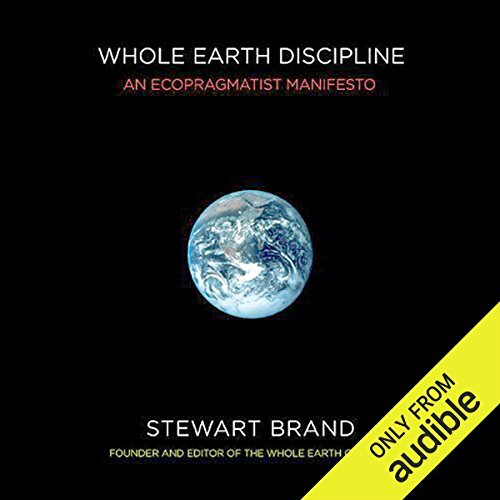 ©2009 Stewart Brand (P)2009 Audible, Inc. I'm an engineer. I've always been skeptical of the magnitude of man-made global warming. A piece from NASA was enough to convince me that I was wrong - that exogenous factors are not enough to explain the increasing rate of change in the climate. That's when I decided to give environmentalists another look. This book opened my eyes. I assumed that most environmentalists were activists - emotional and blind to science. Instead, I found the movement very conducive to science. Best yet, the author shares the engineering perspective of trying to understand the problem in order to fix it. If you’ve listened to books by Stewart Brand before, how does this one compare? I've read a lot of Brand- this is well written and well read. The section on shanty towns. Do you think Whole Earth Discipline needs a follow-up book? Why or why not? As with all futurists, Brand bats about 500. Half of this book is getting more relevant and half is getting less relevant as years pass. If you are a traditional anti-nuke, anti-GMO enviro, this book will really piss you off. Would you listen to Whole Earth Discipline again? Why? I would listen to it again, but I think I would prefer it in a more tangible form so I could make better notes and highlights. I "bookmarked" so many pages while listening to this audio program that it made me really regret getting it in this format. It's very informative and if you're new to environmental studies, it is a great start to get an idea about the successes, failures and pilot projects of green movements. It had comic relief, which was nice. Yes, only because I quickly forgot what the information presented was. I needed to repeat chapters a lot. It's better in book form if you like to annotate. beginning to end this is non-stop fascinating material. it challenged a lot of things that as a lifelong environmentalist I had assumed gave me good phrasing for things I already believed and generally was a great and inspiring read. With the current content of the book nothing. What was most disappointing about Stewart Brand’s story? At the beginning I though Stewart is thinking 'out of the box' with provocative ideas. But content gradually transitioned to absolute craziness. It's generally bad sign if person is hovering over extremes. Stewart started as eco-hippie and it looks like he ended up as technophile who either extremely underestimates negative impact of some man made inventions (e.g. referring to glyphosate as magical substance) or positive values of traditional ways of life. What does Johnny Heller and Stewart Brand (afterword) bring to the story that you wouldn’t experience if you just read the book?